Last year 80 groups and organisations took part, representing all ages and all parts of the community. 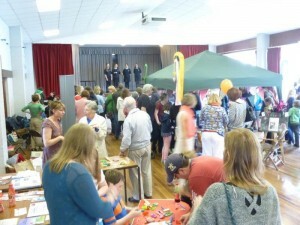 All three halls were busy and a number of groups held successful events on their own premises. Here’s some feedback from earlier years – “We enjoyed the friendly Ledbury company”, “a very worthwhile exercise for us”, “I felt it was a very good day and worthwhile for us as a provider”, “An excellent way to showcase the many talents and societies”, “Worthwhile occasion giving us the opportunity to network with some of the agencies who refer clients to us”, “As a ‘flag waving exercise’ it is good as it notifies/reminds people of our presence”, “Thank you for organising a great event”. The link below will open a printable invitation letter you can take to your group. It includes all the details of how to take part. Application forms available through the links below. If you can use the Word document, please edit it and send it to info@ledburycommunityday.org.uk. if you cannot edit Word files please print the PDF and complete by hand and return to the address on the form. How can my group join in? We would like your group to show to other residents in Ledbury and District and to visitors the things you do and the part you play in local life. You are free to do this in any way that will show off your group and introduce it to others. Please be creative. Consider how to involve others e.g. by inviting people to take a part in your activities on the day to discover more about you. It’s all about joining in. You may choose to work with other Ledbury groups to make a bigger impact. We are asking all groups in Ledbury to take part. Where is Ledbury Community Day taking place? We want groups to be doing their thing all over Ledbury. You can choose to hold your event at the premises you normally use, or you can share with other groups. We are arranging space in the town for this event, including the Burgage Hall, the Community Centre, St Katherine’s Hall, and the Walled Garden. The Recreation Ground is also possible. We will also seek permission to use the ground floor of the Market House for musical performances subject to demand. Please let us know whether you would prefer to be inside or outdoors and what space you need for your display. If outdoors please take any necessary precautions against the weather. We will have contingency for severe weather. How will people know about Ledbury Community Day? We publicise the event in advance in the press, through social media and by local hand-outs and signage – you can help us by spreading the word in your group – it’s an event for everyone in Ledbury and District. We will publish details of your event on this website. See the Participants 2018 page for examples of what we published last year. On the day, we will have information, including a programme with details of everyone’s displays and activities, and people available to point people in the right direction for the events they want to attend. When in the day should my group’s event take place? It’s your choice when on Saturday 8th June to hold the event if running on your premises – it will be June so there will be plenty of daylight. We want things to be happening all through the day, so that everyone can experience many different things. Remember that we want you to visit other groups as well! The public halls will open to the public only from 10am to 2pm – from past experience this is when most want to visit the event in town. How can we benefit from taking part? It’s your day – you can use it to recruit more members, you can use it to raise funds for your group or a favourite charity, or you can use it just to show off what you do and have fun doing it, celebrating Ledbury’s excellence. Contact us by email: info@ledburycommunityday.org.uk.